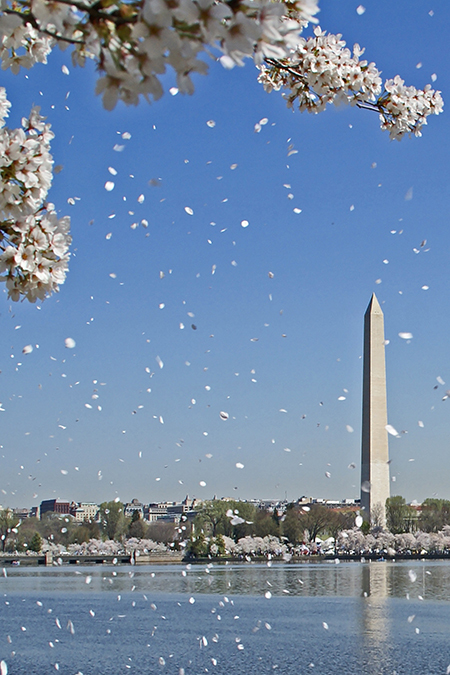 Washington DC Gift Shop is proud to present the "Blossoms Chasing Wind by Luke Wilbur". This is one of Luke Wilbur's studies of Springtime flowers in Washington. This limited edition photo art print depicts falling Japanese cherry blossoms on the Thomas Jefferson Tidal Basin. The Washington Monument is in the background. Blossoms Chasing Wind art print is Approximately 30" x 20". Luke Wilbur's signature is on the back. This patriotic and evocative picture would fit into any home or office. Ask us about other sizes of Blossoms Chasing the Wind that we may have available. 20" x 30" Canvas hand-assembled frame using high quality Plantation Grown Radiata Pine and recycled natural wood.